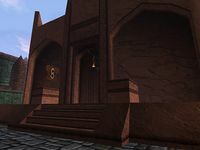 The Temple of Arkay is located in Stros M'Kai near the town plaza, just west of the Mage's Guild. Nidal is the temple's only priest, since the disappearance of Brother Kithral. The body of Prince A'tor is hidden here, inside the central tomb. At the beginning of the quest Raze the Palace, Cyrus takes Saban and Coyle to the temple in order to restore the Prince using the soul gem. Basil and his men, as well as Iszara, show up to observe the ritual. Brother Nidal and Cyrus open the tomb and Saban uses her magic, but A'tor's soul enters his sword instead of his body. Cyrus manages to revive the Restless League's morale with a speech, and within the Temple of Arkay they plan their attack on the Palace. The temple's interior is largely empty. Other than the tomb in the central raised area, the only notable objects are altars in an alcove of each wall except the doorway. The ceiling displays a set of images showing seasons of a tree and phases of the moon. This page was last modified on 23 August 2018, at 20:43.